It took hitting rock bottom for the war vet Earl Granville to take back his life. Did you watch any of the Paralympics in Rio? The Paralympians are awesome athletes, but I don’t believe they should be in a separate category. They are high achievers by any standard. They make no excuses for themselves, have a warrior mindset, and get the job done -- just like my guest Earl Granville. I interviewed him right after a 70+ mile, 60-hour Spartan Agoge on a mountainside in Vermont. I was wobbly as hell as we talked, but Earl looked spring fresh and relaxed. 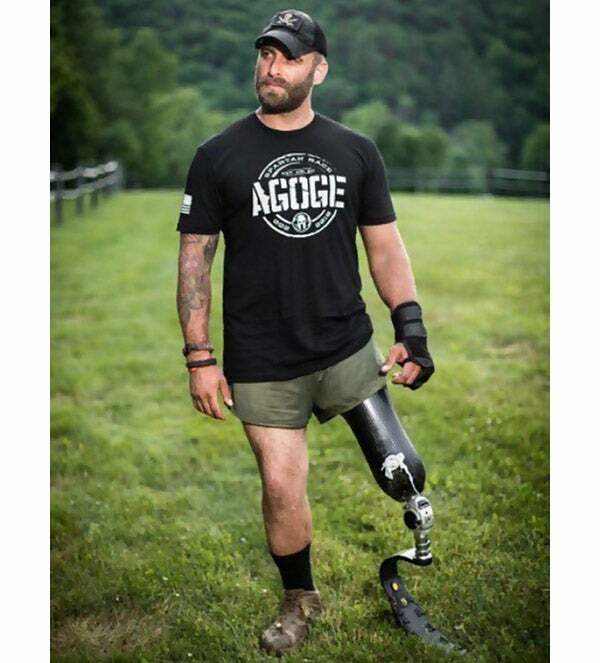 And he had dominated the Agoge on a prosthetic leg, with a painful biological leg. Talk about badass. And that’s not even the biggest challenge Earl has had to overcome. He has put adversity in a chokehold and used it transform himself into a better person. He said he conquered this challenge and pushes through for the people who aren’t here anymore. And he does it by taking it one step at a time -- and being thankful that he’s still here. Earl's transformation began when he was a staff sergeant serving in the Army. His military vehicle was blown apart by a roadside bomb. He was the sole survivor. This is how awesome Earl is -- his main concern when he woke up was being unable to grab his weapon to protect those around him. He was medevaced out to Germany, where they took his leg, and then transported to Walter Reed Army Hospital in Washington, D.C., where he fought to save the remaining leg. He required many surgeries. But the morale of his fellow soldiers and finally seeing his family lifted his spirits. You might be surprised to hear this, but Earl thinks of it as a pretty good time in his life. However, this might be why he missed something terribly important. Earl's twin brother, Joe, had enlisted with him, and until Afghanistan, they had served together. They even bunked together in basic training. But Earl went off to Afghanistan on his own because Joe was expecting his second child. At the time, Earl didn’t realize the guilt his brother felt, but there were clues. For one thing, Joe was afraid to enter his brother's hospital room. Earl realizes now that the first signs of problems were there, but he missed them. Two years later, Joe took his own life. “That’s when my lowest point actually hit,” Earl said. He plunged into depression, bitterly wallowing in his loss and angry at the world. Then, one night at a bar when Earl was drowning his sorrows in booze, a man came up to him. “Are you Earl Granville?” he asked. Earl made a sarcastic remark about the prosthesis giving it away, but then the stranger said something that changed Earl’s life. “You know, your brother talked all the time about how much he admired you,” he said. It was his wake up call. He started drinking less and exercising more. He took up adaptive sports like snowboarding and sled hockey. He embraced CrossFit and started to build himself back up to the shape he was in when he was in the military. And he started competing in the Spartan Race. He realized something we believe in at Spartan. It’s a privilege to be alive, so get motivated, give back, get in shape and get out there and help other people. “You have to inspire people so they can go on to inspire others.” It’s the Multiplier Effect. If you can inspire 10 people, and they can inspire 10 and so on, pretty soon you’re moving the world. More importantly, Earl realized he could use this experience to realize his full potential in all aspects of his life. Today he counsels military and veterans on how to get help and find their purpose and passion after the life-altering experiences of war. And he blazes a path filled with potential. Trust me when I say this -- we’d all be doing great if we could just keep up with him.